Want to see where your pet has been but can’t spare the battery life for Adventure recording? No problem! 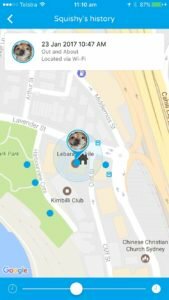 The Pod’s Location History feature allows you to reflect on 24 hours of all known locations of your pet without syncing. You can even click on each individual location to see the location method (GPS, Wi-Fi or Bluetooth) and the exact time it was recorded. This feature can really come in handy if your pet escapes and you want to see the direction they travel in.